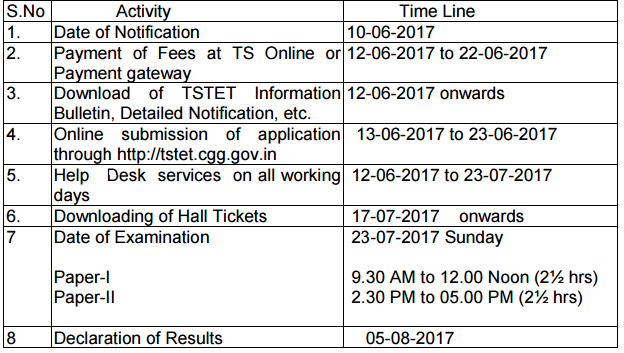 TS TET Notification 2017, Exam Dates, Apply Online Procedure available at tstet.cgg.gov.in. Candidates can check telangana tet exam dates, eligibility, fee, procedure for apply online. 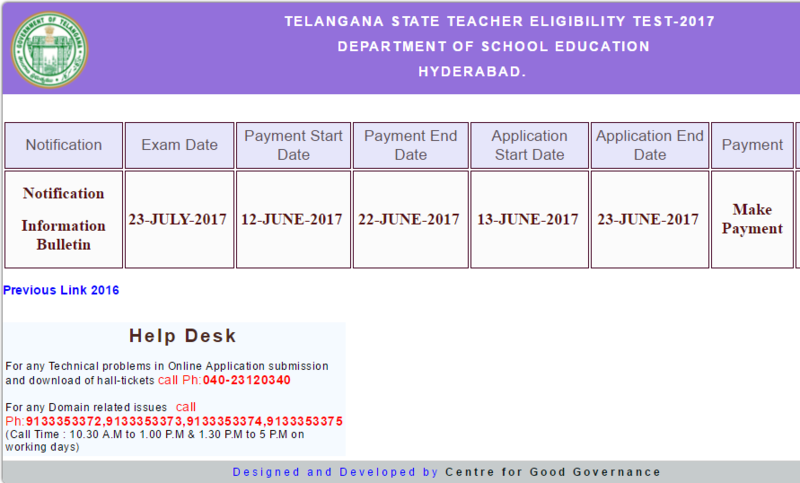 Online applications are invited from the eligible candidates who intend to be teachers for classes I to VIII in schools in Telangana State for appearance in the Telangana Teacher Eligibility Test (TS-TET-2017) to be conducted by Department of School Education, Government of Telangana State on 23rd July 2017 in all 31 Districts of the State. In accordance with the provisions of sub – section (1) of section 23 of the Right to Education Act (RTE), 2009, the National Council for Teacher Education (NCTE) had vide it’s Notification dated 23 rd August, 2010 laid down the minimum qualifications for a person to be eligible for appointment as a teacher for classes I to VIII. It had been inter alia provided that one of the essential qualifications for a person to be eligible for appointment as a teacher in any of the schools referred to in clause (n) of section 2 of the RTE Act is that she/he should pass the Teacher Eligibility Test (TET) which will be conducted by the appropriate Government in accordance with the Guidelines framed by the NCTE. Accordingly, Government of Telangana State has issued guidelines for conducting Teacher Eligibility Test in Telangana State vide G.O cited in the reference above. All candidates who possess D.Ed./ B.Ed. / Language Pandit or equivalent qualifications and candidates pursuing final year of the said courses with requisite percentage of marks obtained as given in the Information Bulletin of TS-TET-2017 and who aspire to become teachers for classes I to VIII in the schools of the State Government, Mandal Parishad, Zilla Parishad Schools Private Aided Schools and Private unaided schools in Telangana State can appear for TS-TET. The candidates who did not qualify in the 1 st, 2nd and 3 rd and 4 th APTETs and 1st TS-TET 2016 can also apply for the TS-TET-2017. Further, the candidates who got qualified in the earlier TETs can also apply for TS-TET-2017 if they desire improvement over their previous TET score. Note: “The Government may impose additional qualifications over and above these qualifications specific to a teachers post at the time of the Notification for Teachers Recruitment Test”. The TS-TET-2017 will be conducted in 2 papers viz. Paper-I & Paper-II. The candidates who intend to be teachers for classes I to V have to appear for Paper-I and the candidates intend to be teachers for classes VI to VIII have to appear for Paper-II. The candidates who intend to be teachers for all classes from I to VIII can appear for both papers, Paper-I and Paper-II. The fee prescribed for appearing for TS-TET (including examination fee) is Rs. 200/- (Rupees Two hundred only) for only Paper-I or only Paper-II or both. Candidates can pay the fee through TSonline or Payment Gateway centres between 12.06.2017 to 22.06.2017 and submit online application at the TSTET website http://tstet.cgg.gov.in between 13.06.2017 to 23.06.2017. Detailed procedure for applying ONLINE is given in the Information Bulletin. Candidates can download the ‘Information Bulletin’ free of cost from the TS-TET website: http://tstet.cgg.gov.in from 12.06.2017 onwards. Candidates submit their applications online from 13.06.2017 to 23.06.2017. The candidates at the time of applying for TS-TET 2017 should be in possession of the minimum qualifications prescribed for a teacher for I to V classes (Paper-I) and VI to VIII classes (Paper-II) as given in Information Bulletin. The candidates who are pursuing final year of any of the Teacher Education Courses recognized by the NCTE or the RCI, as the case may be, and / or the Language Pandit Training Courses can also appear for the TSTET-2017. However, it is clarified that appearance or a pass in TS-TET by itself will not vest any right in a candidate to be considered for appointment to the post of Teacher in Government / Zilla Parishad / Mandal Parishad / and Private Aided Schools, unless he is in possession of the qualifications prescribed for appointment to such post in the relevant statutory recruitment rules framed by State Government from time to time as on the date prescribed there in for possession of such qualifications. Details of qualifications prescribed for TS-TET are provided in the Information Bulletin. b) Syllabus for TS-TET can be downloaded from http://tstet.cgg.gov.in. Validity period of TET Certificate / Marks Memo: TS-TET Certificate / Marks Memo shall be valid for a period of 7 years from the date of TET examination in accordance with NCTE Guidelines. Weightage for TS-TET Scores in selection in Teachers Recruitment Test of Telangana State 20% weightage will be given to TS-TET scores in the ensuing Teacher Recruitment of the State Government i.e., 20% weightage is for TS-TET score and 80% weightage for written test in Teacher Recruitment Test (TRT). Storage of examination material: The examination related material will be preserved for six months from the date of examination and no application in this regard will be entertained beyond this period. Exemption from passing TS-TET: Teachers who were appointed before NCTE notification, dated 23.08.2010 on selection by District Selection Committee or by competent authority in Govt. / Local Authority as per Recruitment rules prevalent at that time are exempted from appearing TET Exam. However, teachers working in private schools whose appointments were not approved by competent authority in Government are not exempted from passing TET. Such teachers of private unaided schools can also appear TET conducted by either state Government or Central Government. Teachers working in private aided schools whose appointment is not approved by the competent authority should invariably pass TS-TET only. Sirr 🙏🙏🙏🙏🙏🙏🙏🙏🙏🙏🙏🙏🙏🙏🙏🙏🙏🙏🙏🙏🙏🙏plzzz give edit option this is life issue. Sir i wont get such opportunities again i ll loss my life sir plz give a chance to correct my mistake. Sir, i am frm btech..nd i hav choosen maths and english as my methodologies in b-ed… is that ok or do btech students should opt only for maths nd physics as their methodologies?? plzz infrm me sir..
Sir if give any information abt edit option. Sir im not upload my sign with my photo.i upload only photo in tet application form.pls gv chance to upload my sign.pls gv edit option. But my first language is hindi in my ssc certificate. Will they accept my form. can nonlocal candidates eligible for ts tet? What is the maxinum age limit for tet?